The University of the Highlands and Islands has a number of undergraduate, postgraduate and research programmes, most of which can be studied at a range of locations across the area. There are 8,720 students who are on undergraduate and postgraduate courses and 33,000 further education students. There are 70 learning centres spread around the Highlands and Islands, Moray and Perthshire. In April 2001, it became known as the UHI Millennium Institute, following the Scottish Parliament awarding Higher Education Institute status. By 2004 full-time deans had been appointed to its three faculties, with experienced figures having been attracted from other academic bodies. University degrees were authenticated by the Open University Validation Service, the University of Strathclyde and the University of Aberdeen until 2008 when the UHI was given taught degree awarding powers (tDAP) by the Privy Council under recommendation from the Quality Assurance Agency for Higher Education (QAA); Higher National Certificate and Higher National Diploma courses are awarded by the Scottish Qualifications Authority. In the Faculty of Arts, Humanities and Business, courses such as honours programmes in Gaelic, Theological Studies, and Scottish History, all reflect the distinctive nature of the region, its past, present and future. The Centre for History is based in Dornoch and teaches a range of undergraduate and postgraduate degrees via videoconference to students around the UHI network and worldwide. The faculty also offers a groundbreaking interdisciplinary course in Scottish Cultural Studies, which received the 2005 Times Higher Education Supplement Award for Most Imaginative Use of Distance Learning. Other postgraduate masters programmes cover the culture, literature and history of the Highlands and Islands, Material Culture and Gàidhealtachd History, Orkney & Shetland Studies, and Viking Studies. The business school offers distinctive programmes such as Scotland's only degree in Golf Management, and Adventure Tourism Management, using Lochaber, the UK's Outdoor Capital as a living research laboratory. ^ Munro, Alistair (30 October 2013). "Highlands and Islands Uni in new principal search". The Scotsman. Retrieved 12 June 2014. ^ "About UHI". University of the Highlands and Islands. Retrieved 12 June 2014. ^ "Facts and figures". The University of the Highlands and Islands. Retrieved 12 January 2016. ^ "Change in law could be the only way forward for UHI". Times Higher Education. 1 September 2000. Retrieved 16 June 2014. ^ Brown, Mike (4 November 2003). "Homeward bound". The Guardian. Retrieved 24 May 2016. ^ "New UHI deans bring title bid closer". Times Higher Education. 15 October 2004. Retrieved 29 June 2014. ^ "Highlands university moves step closer as key hurdle is cleared". The Scotsman. 26 June 2008. Retrieved 29 August 2016. ^ "UHI is awarded taught degree awarding powers". Highland Council. 26 June 2008. Retrieved 29 June 2014. ^ "Degree-awarding powers and university title". Quality Assurance Agency for Higher Education (QAA). 29 November 2012. Retrieved 26 July 2014. ^ "UHI Millennium Institute gains full university status". Times Higher Education. 27 January 2011. Retrieved 12 June 2014. ^ "Highlands and Islands' UHI wins university status". BBC News. 2 February 2011. Retrieved 17 July 2014. ^ "Princess Royal new Scottish university's chancellor". BBC News. 6 June 2012. Retrieved 17 July 2014. ^ "About UHI: Principal and Vice-Chancellor". University of the Highlands and Islands. Retrieved 29 June 2014. ^ "Highlands university appoints biomedical scientist as new principal". STV News. 4 February 2014. Retrieved 29 June 2014. ^ Campbell, Rita (2 June 2014). "Marine physicist elected as university lecturer". Press and Journal (Scotland). Retrieved 29 June 2014. 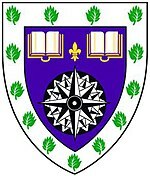 ^ "Scotland's newest university unveils coat of arms ahead of royal event". University of the Highlands and Islands. 31 May 2012. Retrieved 19 July 2014. ^ "Facts 2014" (PDF). University of the Highlands and Islands. Archived from the original (PDF) on 9 September 2014. Retrieved 8 September 2014. ^ "Home: Courses: Undergraduate" (in Scottish Gaelic). Smo.uhi.ac.uk. Retrieved 29 June 2014. ^ "Theological Studies (BA Hons)". University of Highlands and Islands. Retrieved 28 June 2014. ^ "Scottish History BA (Hons)". University of Highlands and Islands. Retrieved 28 June 2014. ^ "Scottish Cultural Studies BA (Hons)". University of Highlands and Islands. Retrieved 28 June 2014. ^ Thomson, Alan (2 December 2005). "Proud winners and PM sparkle at first awards". Times Higher Education. Retrieved 28 June 2014. ^ "Golf Management BA (Hons)". University of Highlands and Islands. Retrieved 28 June 2014. ^ "Adventure Tourism Management BA (Hons)". University of Highlands and Islands. Retrieved 28 June 2014. ^ "New course enables primary teachers to train in Highlands and Islands". University of the Highlands and Islands. 30 August 2013. Retrieved 29 June 2014. ^ "Teacher training places double at UHI". Scottish Government. 16 April 2014. Retrieved 29 June 2014. ^ "Sustainable development BSc (Hons)". University of Highlands and Islands. Retrieved 6 July 2014. ^ "University launches first international undergraduate degree". University of Highlands and Islands. 28 March 2012. Retrieved 6 July 2014. ^ "Sustainable Rural Development MSc". University of Highlands and Islands. Retrieved 6 July 2014. ^ Freeman, Tom (20 September 2016). "UHI to take over Highland nursing training". Holyrood. Retrieved 24 November 2016. ^ Mackenzie, Ruth (28 June 2014). "Alexander Graham Bell Centre open". Press and Journal. Retrieved 28 June 2014.